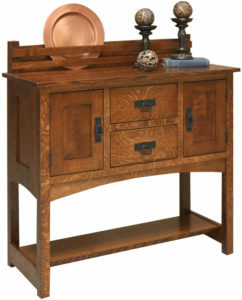 The Modesto Sideboard is a traditional mission piece of furniture. It has the straight slats on the sides, exposed tenons and an elevated back. Place your decorative plates, vases and candles on top for a beautiful display that coordinates with your home decor. Then, put your dishes or glasses behind the closed doors and table linens and silverware in the drawers. Finally, you will have a beautifully organized room ready for entertaining. We make each piece out of solid wood and only begin construction after we receive your order. This allows you the option to customize it to meet your needs. For example, order it as you see it here in quartersawn white oak with Michael’s cherry finish or select your favorite wood species and finish. Contact us at Brandenberry Furniture in Shipshewana, Indiana. 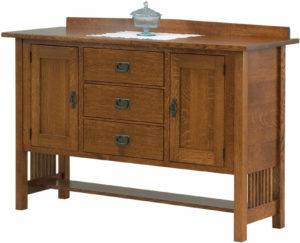 This Modesto Sideboard is an excellent choice for your dining storage needs. Choose your options and request a quote: email, call, or visit us. We look forward to helping you select custom options and create a truly unique piece. Be sure to browse our dining tables, chairs, and other related products so you can complete the perfect look in your dining room.